We’ve all walked into a pub, asked for a pint and then been underwhelmed by the resulting wet stuff that is more fizz than taste, and fails to satisfy. And if you are like us, you’ve probably had to queue to buy it for longer than it takes to sink the drink! So allow us to introduce you to The Biergarten, Milton Keynes’ first micro-pub where the beer is chilled and service warm. Having already won over the foodies with the introduction of MK Feast, Franzi Florack is the brains behind this new venture too. It opened its doors at the start of May in Wolverton and is keeping thirsts at bay with a plethora of beers. The Biergarten offers bottled and draft craft beer from the UK and further afield, and you can drink in comfort, not propped up at the bar. 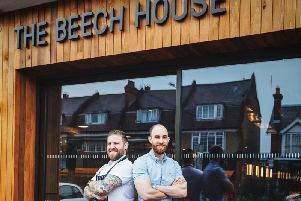 “It is going to become the ideal destination for beer lovers who would like London’s range and expertise in craft beer but are also looking for that little bit of northern hospitality,” says Franzi. An inviting seating area offers tasting space for 20 people and a three-tap bar will also work for you. “Local beers are sourced via the breweries,” Franzi said, “We currently have 18 on our list and hope to discover more over time. And the snuggly social space really is a break from the norm – you can pop in on your own, or with pals, and enjoy a pint or two in a pleasant space where you won’t fill ill at ease. Quite the contrary – you’ll find it very easy to settle in and stay put! Even the way the venture came together is cool – 12 beer-loving locals and their families invested in the community scheme. “When my partner and I moved to MK last year, we were desperately looking for a friendly, comfortable place to go to on a Friday evening and while there are some nice pubs in MK, not many of them champion the diversity of the local beer scene,” Franzi says, explaining how the seeds for The Biergarten were sown.